A Sock Cupcake makes a really cute gift. And, like the real thing, you just can't stop at one!! Our love of cupcakes has started a cupcake craze with all sorts of craft items. 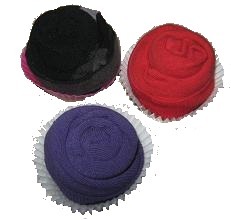 One of the latest trends in cupcake craft is rolling socks until they resemble cupcakes. Box up a mixture of socks, home-made cupcakes, and flannel cupcakes for a perfect gift to take Mom and a newborn baby. You can also make cupcake gifts with bibs, all-in-one outfits, pajamas, singlets or diapers. What a gorgeous gift box these would make. Or, follow the instructions and make sock cupcakes for Mom as well. We all know she'd appreciate the thoughtful gift. For my daughters, I have also wrapped knickers into cupcake shapes. Place the pair of socks together and roll them up starting with the bottom of the sock. When you have completed rolling the socks, take the open end of one sock and open it out and slip it up halfway on the socks. 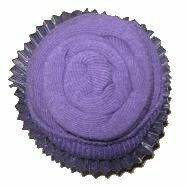 Place sock into a cupcake paper. I have often bought the silicone wrappers as they are a perfect size for the completed socks. I promise it makes sense when you are making them.